A single lap of the velodrome out of the starting gate, riders will blast around the 250 metres one at a time in a straight final. This event will be decided in the Thursday morning qualifying session with the medal presentation to be held in the evening session. 2012 NZ Track Nats: No surprises to see the five members of the Elite BikeNZ Sprint squad filling the top five places. This event was held under a different format 12 months ago with the top four riding off in finals to decide the medals. Team sprint starter Ethan Mitchell was quickest out of the gate with a 17.645 and rode Matt Archibald (17.928) for gold while Eddie Dawkins (18.095) and Sam Webster (18.345) squared off for bronze. Mitchell took gold by nearly 0.4 seconds while Dawkins took the bronze by less than 0.2 seconds. NZ Record: The current low mark is the time Mitchell recorded in the gold medal ride last year, 17.610. What’s Happened Since: In short, Ethan Mitchell has got faster. He rode a 17.558 in Qualifying at the World Champs last year, followed by a 17.516 in the bronze medal winning finals ride, 17.396 in the First Round ride at the Olympics and then staggering 17.238 and 17.265 laps at the UCI World Cup in Mexico two weeks ago. Matt Archibald has continued his rapid improvement to the point where he is now a realistic option for second wheel behind Mitchell in the Team Sprint while Eddie Dawkins, Sam Webster and Simon van Velthooven have all won medals in international competition over the last 12 months. Who to Watch: The times above would point to the closest thing to a sure bet, with Ethan Mitchell one of the world’s premier Team Sprint lead-out men. With four other men battling for two team sprint starting spots, the race for silver should be fascinating. The same format as the Elite Men’s event, this will be the first medal decided at Track Nats on Thursday. 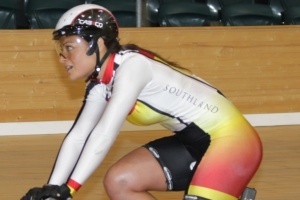 2012 NZ Track Nats: Otago’s Katie Schofield showed why she has held down the starting spot in the Women’s Team Sprint programme, qualifying fastest in a time of 19.594 and took on Natasha Hansen (20.218), while Steph McKenzie (20.384) lined up against Vanessa Quinn (21.353) for bronze. Hansen narrowed that gap to 0.319 in the final but the gold went to Schofield with McKenzie taking bronze by over a second. NZ Record: Schofeild’s 2012 qualifying ride of 19.594 is the fastest time recorded in New Zealand. What’s Happened Since: The women’s sprint programme went within a whisker of qualifying the team sprint for the Olympics, narrowly missing earning a berth with a disappointing result for tenth in Melbourne at the 2012 World Champs. Opportunities to see the elite women’s programme in action have been limited since, however Hansen and Schofield did team up to take out the Oceania title in Adelaide in November. Who to Watch: As the Team Sprint starter, Schofield will start as favourite but there appears little between her and Hansen with Southland’s Steph McKenzie also right in the mix. Add in the Junior Worlds silver medal-winning duo of Paige Paterson and Vic Steel, making their Elite debuts and this will be a fascinating competition.